What is UpRight Movement’s Intake? How can I tell if I am developing more functional UpRight Movement efficiency? How do I prevent a fitness setback? Why the AM and PM exercises? What are exercise supplements and restoratives? UpRight Movement is a developmental-based movement approach informed by functional anatomy, human biology and Newtonian physics. These are the non-biased constructs and confines within which the human body operates. 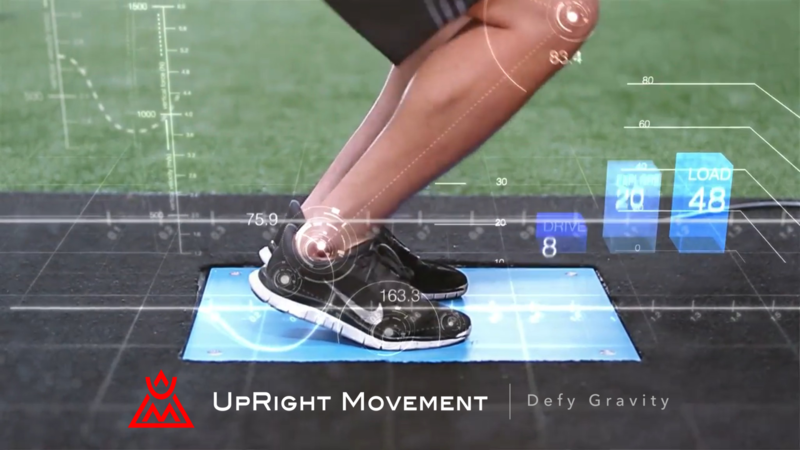 UpRight Movement is influenced by the injury rehabilitation and sports performance fields, bringing a seamlessly integrated approach that bridges the gap between rehabilitation and performance. UpRight Movement takes a holistic approach, looking at the beginning, middle, and end points of movement. We consider a hierarchy of movement that is built upon the foundation of mobility (flexibility + strength) and stability (reflexive resistance to change, e.g., in walking gravity attempts to pull us down while we resist and stay upright). This foundation involves musculature that is functionally more postural in nature with finer motor control, and from which gross muscles and movements operate. These essentials when in place provide efficient support to higher demand activities, minimizing over compensation of movement and reducing injury potential. Expected outcome: improved results. UpRight Movement also considers the other remaining hours within the day, and the other variables and stressors that may take away from your results. 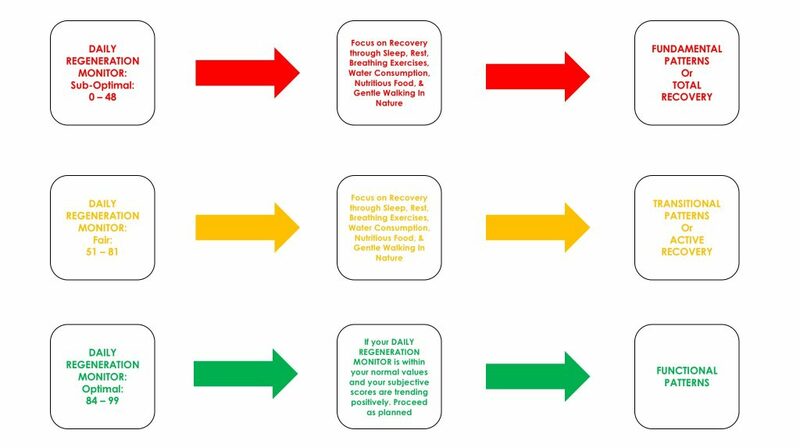 It is vital you consider recovery just as important as training, for they are interdependent. Regeneration: It is important to understand that everything in the system will break you down and this is the time when we educate and execute regeneration strategies to ensure optimal performance during future training sessions. UpRight Movement does not fix people. UpRight Movement takes a big picture view in the beginning with intake. 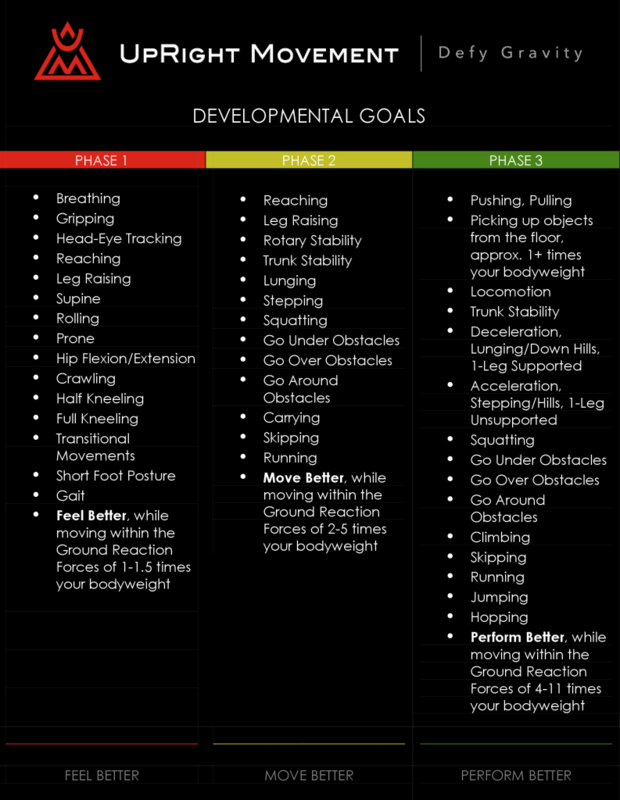 Our formula: An Individual’s Abilities + Expected Movement Demands = Proper Movement Based Planning. Strategies are recommended to help address abilities and demands. It is paramount we work these strategies, so as they work for us. Training for real, sustainable results is a process requiring consistency over time. Usually the longer and greater an imbalance has been established the equal or greater our consistency is required. UpRight Movement DOES have the knowledge, the tools, and the dedication to support you. When preparing for, and arriving at, your appointment, please wear light-colored, workout-type clothing. Your Performance Specialist will want to see your shoulders, spine, ribs, hips, knees and ankles as best they can. For women, if you aren’t comfortable wearing a sports bra, please wear a tank top. For men, please wear a t-shirt and shorts. For both males and females please wear or bring tennis shoes. You can bring your clothes to change into if need-be. Discussing your symptoms, current struggles, and ultimate goals with your Performance Specialist. Postural photos (photos will be updated throughout the process to document postural changes). Postural analysis and discussion of compensations and dysfunctions that may be contributing to your pain. Execution of your recommended routines, designed to restore function to your body and eliminate pain. An emailed website invitation with PDFs and videos of how to do each exercise. You will continue to do your recommended routines daily in your own home. You and your Performance Specialist can discuss any questions or concerns that arise as you work through your exercises. Your Performance Specialist will suggest the desired amount of time between appointments. Remember, UpRight Movement is a process, which includes: Mindset, Recovery, Nutrition/Hydration, and Movement. Click here to learn about the UpRight Movement Principles. Regeneration: The Regeneration piece is often missing from other programs but it’s really the key for improving overall performance. Recovery or Regeneration is more than rest days. It’s a mindset integrating strategies of sleep, nutrition/hydration, soft-tissue work, and other self-care that we choose to live every day, week, month, and year. Training within your functional limits is critical to preventing training-related setbacks. UpRight Movement’s three-phase training system is designed to demonstrate the techniques consistent with your phase of function. Exercise supplements and restoratives are designed to offset the lack of movement during the course of your day. These supplements and restoratives may seem simple, although they are powerful and aid in structural and movement health. For many they are less demanding than training, however they are supportive and equally important. Each supplement and restorative can be used to elicit different responses. They are used by UpRight Movement Performance Specialists to help you achieve results.